The US has elected a third-party candidate to be President. The College of Cardinals have chosen an African bishop as the Pope. On the other hand, the more things change, the more they remain the same: There is trouble in the Middle East, and the US wishes to intervene. 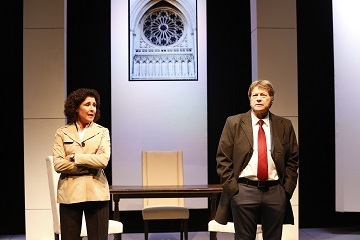 In The Road to Damascus, at 59E59 Theaters through March 1st, Tom Dulack envisions a not too distant future with some promise for better outcomes, despite terror attacks in Miami and New York. The NSA, in the person of Bree Benson (Liza Vann), is determined to retaliate for the bombings. 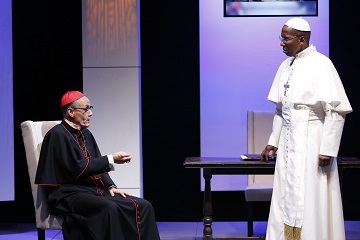 In an effort to control the situation, the State Department’s Ted Bowles (Joseph Adams) assigns his underling Dexter Hobhouse (Rufus Collins) to meet with the Pope (Mel Johnson Jr.) Hobhouse has connections, well really a connection in the Vatican. Can Pope Augustine avert the conflagration that threatens in Syria? Will diplomacy or brinksmanship prevail? The Pope believes he has a secret weapon in Nadia Kirilenko (Larisa Polonsky,) a reporter for PanArabia TV and a friend from his days in the Congo Will his staff, Bishop Roberto Guzman (Joris Stuyck) and the Vatican Secretary of State, Cardinal Medeiros (Robert Verlaque) be supportive of Augustine’s plans? Under Michael Parva’s well-paced direction, The Road to Damascus is both intriguing and realistic. Tom Dulack’s play offers arresting insights into world affairs, while maintaining its dramatic integrity. The Road to Damascus is touching, funny, tragic and poignant. 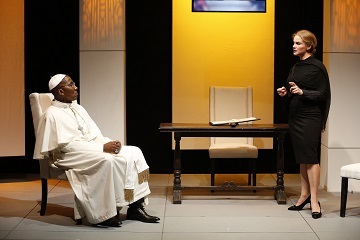 The acting is excellent wih Mel Johnson Jr, Joris Stuyck and Larisa Polonsky standing out in this outstanding ensemble. The Road to Damascus is produced by the Directors Company and presented as part of the Inaugural 5A Season of “groundbreaking new works” at 59E59 Theaters. Planning to take advantage of nycgo.com’s Broadway Week? Tourist or native New Yorker, be advised that you get more opportunities to fill up your dance card if you include the Thiursday matinee in your plans. Photo from “The Phantom of the Opera” by Matthew Murphy. 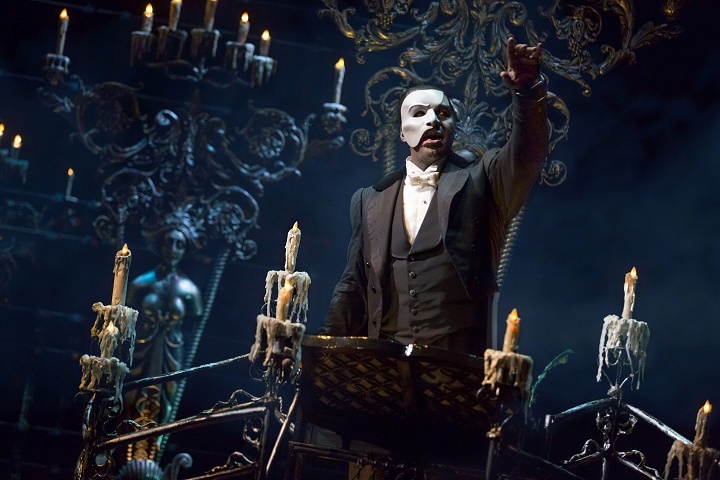 “Phantom” has replaced its Wednesday matinee with one on Thursdays. If you stick around on matinee days (now Wednesday, Saturday, Sunday and Thursday,) and see another performance in the evening, you will have seen 8 shows in just four days! Add the Monday evening, that Chicago gives you — one of the few if not only- shows with a Monday evening performance, plus Tuesday, and Friday, you can be at a theater every day of the week. With the twice on Saturdays, Sundays, Wednesdays and Thursdays schedule, you’ll catch up with nearly a dozen of Broadway’s hits, and that’s just in the first week. Using my scheme to go to performances that are open when others are closed, you may even be able to get through the whole list of participating shows during the Broadway Week(s). Coming up soon, “Off-Broadway Week,” so you can see even more theater. Get alerts from nycgo.com. If you’re coming in from out of town, plan your NYC stay around the best of our city’s cultural attractions. If you’re a New Yorker with a day job, make your vacation coincide with what’s on The Great White Way and the off-stem theaters. The New York City Ballet to me is uniquely our home-grown ballet company. I grew up with George Balanchine’s troupe, enjoying the dancing of Jacques d’Amboise and Suzanne Farrell from the cheap seats at City Center. I always imagined d’Amboise, a son of Dedham, MA, to be a cosmopolitan Parisian until I saw him showcase his young students from the National Dance Institute he founded in a ceremony in Central Park a few years back. Wherever he came from, d’Amboise was a polished and elegant presence on stage. Balanchine created many works especially for him to dance. I have witnessed too many grand performers and performances at NYCB, now at home at Lincoln Center, to even try to enumerate them. I missed a lot of them, too; for instance I never saw the Jerome Robbins-Mihail Baryshnikov “partnership” when Robbins created Opus 19: The Dreamer (1979) for him. Today’s crop of NYCB dancers is marvellous, with Sara Mearns a personal favorite on the women’s side; I love the extension and the energy in her moves. Although the perky and talented Megan Fairchild is also wonderful to watch. Over time, more stars will emerge. Balanchine’s dream company, started with Lincoln Kirstein, and aided by the choreographer Jerome Robbins, will evolve. Peter Martins is only the third Ballet Master In Chief at NYCB since its initial founding. New dancemakers, like young Justin Peck to name just one, will create more lovely steps for the company to dance. The dance goes on, moving forward, and eliciting ever more enthusiastic “Bravos” from its enthralled audience. Over coffee with my friend Carlos, I mentioned that Rita Hayworth was paired with Fred Astaire in a film (the name of which escaped me at the time) to which the New York City Ballet pays tribute. 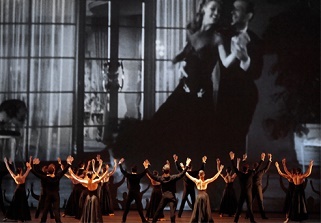 The dance, by Jerome Robbins, is “I’m Old-Fashioned” to a Morton Gould adaptation of Jerome Kern’s song. The movie goes by the non-mnemonic You Were Never Lovelier. If you’ve never seen Hayworth dance, you might wonder if she has the chops. Consult the men in Gilda, where the siren call of her curvy figure comes with lithe and dangerous moves. In You Were Never Lovelier, she is both funny and well-matched with Astaire. Despite its sometimes forgettable title, it is a very effective and in, its own right, like most Fred Astaire vehicles, well-choreographed piece, highlights of which are incorporated into Robbins’ breathtaking ballet. “I’m Old-Fashioned” is in the NYCB repertoire, just not this season. Keep an eye out for it, Carlos; it’s worth seeing whenever it comes up on the bill of fare. Apologies, that’s really awkward! But for the dance enthusiast, there is much to anticipate. There is a dance season beginning here in NYC, although this is New York and there is always a dance season here. Paul Taylor’s spring season begins on March 11th at the David H. Koch Theater at Lincoln Center. Paul Taylor may be one of the most prolific American dance-makers. His 141st choreographed piece, Sea Lark, premiered in Des Moines in November. At 84, he is still making dances which are poetry for the body. His company, recently re-named Paul Taylor American Modern Dance, is athletic, agile and graceful. 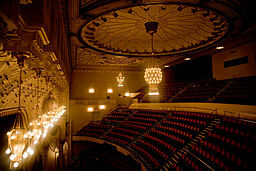 Along with the New York premier of Sea Lark and another new work yet to be named, the reliably exhilarating company will offer Company B, a personal favorite created in 1991, the stately Arden Court (1962) and the elegant Esplanade (1975)– just to name a few beloved pieces from the Taylor oeuvre. Also starting in March (in this case from the 17th through the 22nd), Ailey II, the Alvin Ailey company of young dancers, known for their abundant energy and vigorous interpretation of dances by dance creators that include Jennifer Archibald, Dwight Rhoden, Katarzyna Skarpetowska, and Troy Powell, Ailey II’s Artistic Director. will be at the Joyce. They are performing a two-program repertory featuring works from established and emerging choreographers. 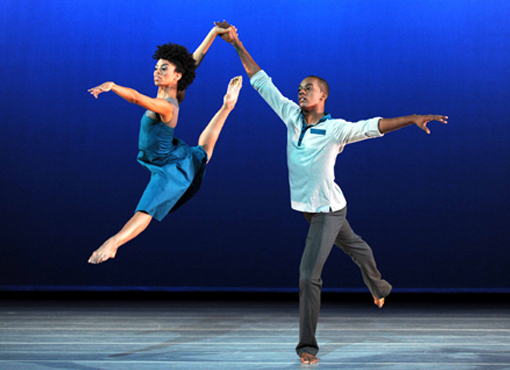 Alvin Ailey was an inspiration and his legacy lives on in the companies that bear his name. His masterworks, most famously Revelations which is the crown jewel of the main company’s holiday performance schedule, are frequently performed but not on this Ailey II repertory. For The Paul Taylor American Modern Dance spring schedule, please go to http://www.davidhkochtheater.com/moreinfoPT.html, where you may purchase tickets for the run. 2014 in review: Thank you for participating!